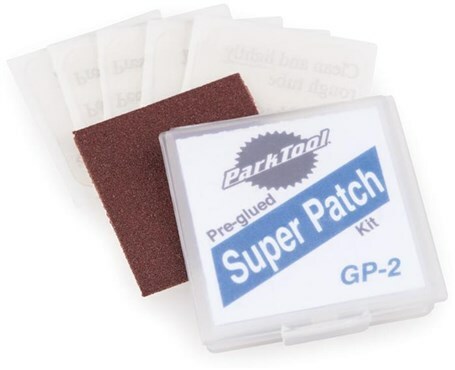 The Park Tool GP-2 Super Patch Kit is a compact set of self-adhesive patches for mending punctures on the go. Easy to carry and taking up little space in your saddle bag these patches are very strong and do the job well. There’s no need to wait for glue to set, so you can get back on the bike sooner. Once in place the GP-2 Super Patch is firmly fixed, providing reliable performance. Quick fixes on the go without a hefty price tag. These patches are easy to peel from the backing and just as easy to apply to the rubber tube. Fixed 3 punctures in the same inner tube and it's still going strong. They last much longer than tube glue kits which once opened has a short shelf life. Forget glue that takes an age to set and orange rubber rimmed patches. These are a revelation in puncture repair! Have used these before very strong and do the job well. A quick fix! Very easy to use take up very little space in the saddle bag. Very reliable and stay in place. These patches are great for quick repair when out riding work really well and so cheap highly recommend. Great bit of Kit... Perfect for that quick repair. Very reliable and easy to use kit. Good for getting you out of a sticky situation. These are the patches you want to buy great price easy to use and reliable!